all indian cinema: What’s in Rahman’s Calendar? 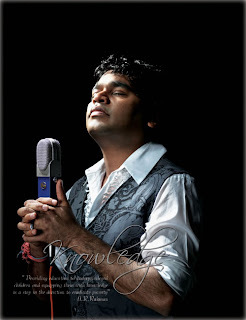 The AR Rahman Foundation released Calendar 2010 in collaboration with Worldlight, a subsidiary of Audio Media Education. The calendar features the Mozart of Madras in various moods captured by Selva Kumar, Photographer & CEO, Audio Media Education India Pvt. Ltd. This desktop calendar also has quotes made by the music genius on music, love and language. This special 2010 calendar is produced in aid of the A R Rahman Foundation which is involved in service activities like helping underprivileged children have access to education. The foundation also provides free education on music for the deserving students in Chennai’s corporation schools.